To celebrate the launch of Apple’s new 10.5-inch iPad Pro, I ordered Pixel C, which arrived three days ago. Worst case, the tablet can be returned for refund during the buyer’s remorse period; there ain’t any regrets so far—just the opposite. To my pleasant surprise, the tab is much more enjoyable than I remember, because Nougat is so pretty, efficient, and buttery smooth than was Marshmallow on the device. The screen scorches any available iPad, Pro or otherwise, and the performance is shockingly nimble. My Pixel C shipped with Android 7.1.1 and quickly updated to 7.1.2. I will soon install Android O; Google released Developer Preview 3 yesterday. There’s a certain insanity to the purchase. I reviewed Google’s Android slate 15 months ago; that makes the thang ancient as measured in computing years. But Big G still sells the tab, and there must be a reason, right? I got another because a college student took possession of my first Pixel C in early 2016. With keyboard cover, the tablet makes a helluva handy carry-along on campus. For all Pixel C’s Nougat sweetness, Apple gives Google a bitter pill: iPad Pro, with promised iOS 11 enhancements, is talk of the town, while Android tablets are, at best, shrinking silos in the Amazon and Samsung digital lifestyle firmaments. The fruit-logo company is showman like no other. Recent iPhone 7 Plus advertisements, like the “Barbers” commercial, and this week’s magnificently staged developer conference keynote create perception that the future is all about iOS devices for personal empowerment and multi-core iMacs for creative professional empowerers. Apple remains an innovation leader, but more by way of iteration than invention. Making iPad Pro more like a Mac is good for the corporate bottom line—should existing computing customers embrace the tablet Dock and drag-and-drop dog and pony show—but not visionary advancements worthy of the new era. Computing is at a crucial juncture, as the PC declines, smartphones rise over its carcass, and artificially intelligent assistant, search, and voice-interaction technologies usher in a new, more intimate technological epoch. But Apple commands mindshare that Google foolishly cedes. That’s unfortunate, because the search and services giant gets contextual cloud computing much better than Apple, as does Amazon (add Facebook, too). Will one cloud available everywhere to anybody be the new era’s future? Or will siloed services along a single vertical stack win the day? Apple bets on the latter, and as its share price soars in 2017, clever marketing tells aspirational stories, and bloggers and journalists can’t write enough about “i” doodads, CEO Tim Cook and his minions freely craft compelling narratives about Siri and environmentally-friendly manufactured gear that will save the planet. Praise be Jesus phone! And its iPad-loving disciples! Convert! Your future is an Apple smartphone and tablet, replacing Mac or Windows PC. Cook and Company have a point. Devices matter. You hold them. Interact with them. Dare I say (cough, choke) love them. Google Assistant may be responsive, but it is lifeless. Intangible. Forgettable, by itself. And it’s harder to market than the thing consumers can see, touch, and command. Google Home is good. So are third-party Android devices. But they’re not enough to turn the narrative away from Apple’s storytelling. Alphabet’s major subsidiary should renew commitment to all its devices carrying the same brand in the three major personal computing categories. Where is the Pixel C2? Or the Chromebook Pixel 3, for that matter? Google needs to continue manufacturing a range of Pixels—not just phones—even if sales volumes are low. As I often say: Enthusiasts are the best marketers. Google loyalists will want, and buy, new Pixel laptops, smartphones, and tablets; if made available. Every Pixel produced is an investment in the broader brand and intelligent search and other services that can make the devices more personal. Cherished, even if only by elite influencers, who alongside traditional marketing will promote the Google digital lifestyle. What I see in Pixel C is amazing promise. The tablet still looks and feels premium nearly one-and-a-half years after its release and performance is shockingly super smooth. Subjective speed exceeds my 9.7-inch iPad Pro, with 256GB storage (vs 64GB for the Pixel). The Apple tab launched in March 2016 but unexpectedly is obsolete, replaced by the larger model unveiled earlier this week (love your comments on that). Switching and closing apps on Pixel C is single-tap easy (no clunky home button). Presentation pleases, in part because of default color and font choices and the higher resolution screen (2560 by 1800 and 308 pixels per inch). The obsolete iPad Pro: 2048 by 1536 and 264 ppi. The new, 10.5-inch model: 2224 by 1668 and 264 ppi. Pixel devices showcase the best capabilities of Google software, hardware, and services. 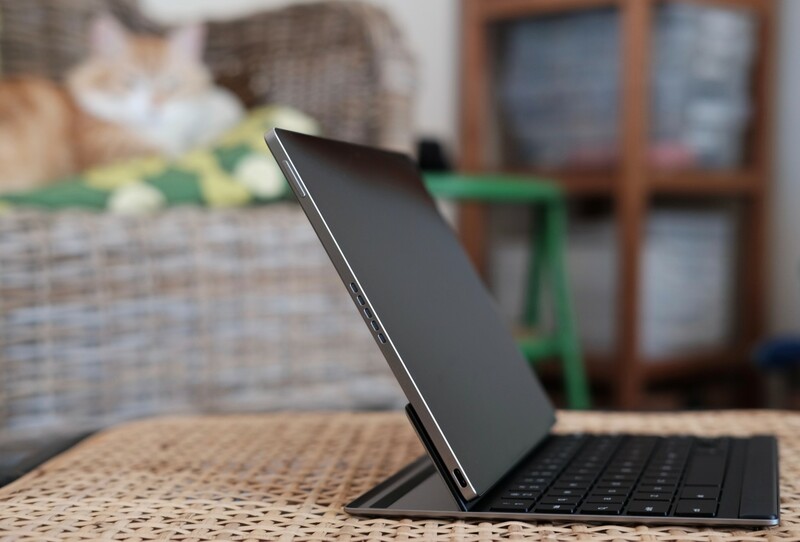 The company wisely has chosen premium design, construction, and capabilities—major reasons that 2015-issue Pixel C and also Chromebook Pixel 2 don’t feel outdated in 2017. These are still competent, competitive computing devices. Apple’s iPad UI choices for OS 11 are mostly about bringing macOS features to the tablet. Google scales smartphone UX (user experience) features and benefits upwards—and they fit, finally, which is something I can’t say about previous Android versions. Touch-obsessed Apple focuses on capabilities and UI elements lifted from the desktop operating system to the mobile. But the user interface of the new era is touchless, voice-activation—something the fruit-logo company keeps promising but continually puts second (if that highly positioned) to touch. Google gets touchless and the power of using voice to ask questions or command tasks. Android O enhancements, and those already available with Google Assisant, promise to anticipate what you want, or need, based on context. Or you can ask for it. Anytime. Anywhere. On anything. But, to reiterate, Android (or Chrome OS) on any device is a tough sell. The brand Pixel provides premium design and build quality as platform for Star Trek computing. Google geeks can ooh and ah. Bloggers and tech reviewers can hold and handle tangible products about which they can post online. Alphabet marketers can create compelling narratives that tell a different story about the future of personal computing. All that shifts attention away from iOS 11 and iPad 10.5. The time is come for Google to ante up and join Apple at the card table. Letting Pixel C, and also Chromebook Pixel, languish is foolhardy. The search and services giant must maintain meaningful, continued commitment to the tablet form-factor, or otherwise cede the category to Apple. Otherwise, why would developers make the investment in larger Androids, while Google sits idle but Apple dedicates resources into expanding the iOS/iPad platform and pitching it as the PC’s future? Surely, app developers will follow the money, or promise of it. There are many aspects by which iOS is the more mature tablet platform. Google can change that by showing the way to third-party manufacturers and developers. Continued commitment to all Pixel form factors is the only way to push ahead. Time is past-due, Google. Up your tablet game, before Apple puts you down.